Students in Big History Project course learn to make warranted claims, a vital element in critical thinking and rational discourse. Since at least the time of Aristotle, this has been a valued goal of teachers and teaching, though it was philosopher Stephen Toulmin who, in his seminal The Uses of Argument (1958), best articulated the elements entailed in making strong claims. A claim, Toulmin “claimed,” is an assertion of fact, judgement, or policy that is grounded, supported, or tested by empirical evidence, credible authority, or reason (ah, BHP’s claim testers). The justification that connects the supports to the claim Toulmin called the warrant. Thus, warranted claims show how the support – the evidence, authority, logic, or even intuition — is sufficient to accept the claim. BHP provides many opportunities for students to learn how to make warranted claims and to evaluate the claims of others. Their scores on unit Investigations show significant growth in BHP students’ ability to use evidence, logic, and disciplinary concepts to reason toward credible conclusion. However, one of BHP’s greatest instructional strengths is the opportunity it provides for teachers to make warranted claims about what their students are learning in the course. 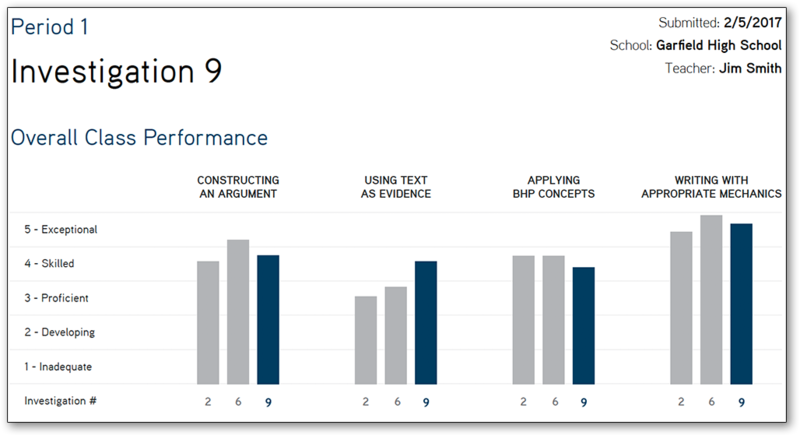 With BHP Score grading the Investigations, teachers can now easily make data-driven claims about what and how well students are learning. Three things make this opportunity for teachers to use the data on their students’ thinking and writing increasingly important. First, it helps teachers effectively and easily meet a growing demand that schools use data to assess what students are learning, and by implication, what and how well teachers are teaching. Over the past 15 years, since 2001’s Elementary and Secondary Education Act, federal and state policy have promoted the use of data to guide decisions about instruction and about teaching at the district, school, and classroom level. This has forced districts to update their data systems while placing new expectations on teachers to gather and interpret data. BHP Score goes a long way to meeting these expectations by offering timely information on student performance, information that is easy to comprehend, interpret, and access since we send it directly to the teachers. 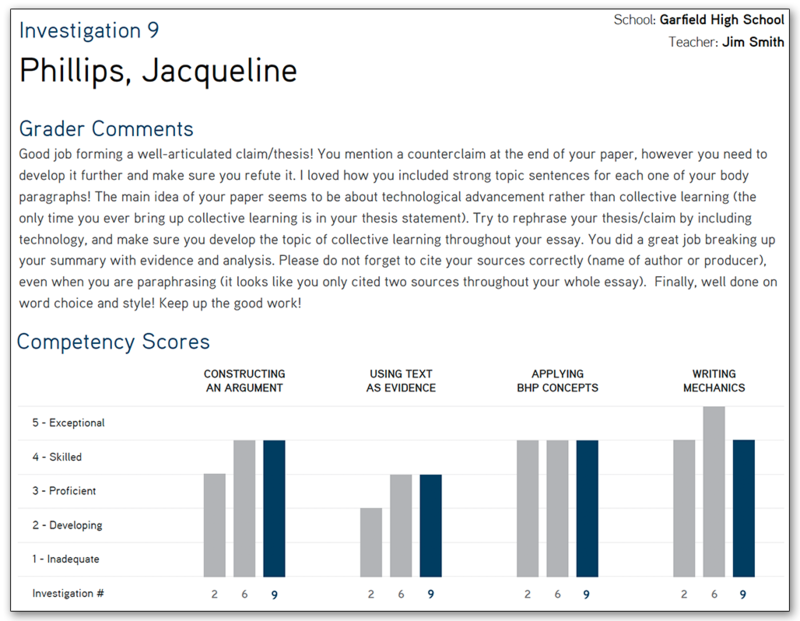 Second, and more important, since BHP is evaluating students’ essays at many points in the course, it is providing teachers information that is typically not readily available or is difficult and time-consuming to gather, yet is necessary to understand changes in student thinking. Thus, BHP is enabling teachers to make data-based, warranted claims about the relative growth in their students’ disciplinary thinking as well as their ability to structure arguments; weigh, evaluate, and use evidence; and apply concepts. In short, since the BHP data does not come from narrow, fragmented learning objectives tested only through multiple choice exams at the beginning and end of the year, it offers teacher the ability to make more nuanced claims about student learning, claims that really reflect the valuable “stuff” they are teaching. Last, BHP data is flexible. Teachers can group or aggregate the scores in multiple ways to show how individual students, groups of students, or entire classes develop over an entire course or at different times in a course. For example, teachers might wish to give priority to changes in students’ use of evidence or application of disciplinary concepts, to identify places in their teaching that generate the most gain or places where students plateau. This enables teachers to make claims about what and how effectively they are teaching and use information as feedback to identify areas of instructional strength or areas in which they might improve. Or, teachers use the data to identify students for whom such thinking and writing comes easily and those who struggle, to surface relative success of a set of lessons or activities on these different “types” of learners. Many BHP teachers have begun to use BHP Score and the Investigations to meet the data demands of their districts. Some teachers report great value in using BHP data to supplement — or is it to counter? – the required information their district draws from standardized multiple-choice tests, while other teachers exclusively use BHP reports to assess their teaching and student learning. Either way, one of BHP’s residual benefits has been the opportunity it offers for teachers to make warranted claims in addition to the opportunity provided for students to learn about claims and claim-testing.